1. Europe is being Islamized, and the pace of Islamization is accelerating. This is quite clear. Go through Lexis-Nexis and check what was happening in Britain fifteen or twenty years ago, and compare it with today’s situation. I lived in England during my formative years in the 1960s, so I remember what it used to be. That’s one of the major reasons why this issue is important to me, and why I do what I do. 2. The importation of immigrants and the destruction of European nation-states is deliberate. Islamization was an unintended consequence of the importation of millions of Third World immigrants. But the process of mass immigartion was a deliberate strategy. Its intentionality is on the public record (especially in the UK) for those who care to look. It was (is) implemented in order to break down the traditional nation-states of Europe. The Socialists and Social Democrats were the main architects, but the so-called “Right” parties largely went along with the policy. The original motivations for this undertaking were mixed. Many of the postwar architects of the EU thought they were building something that would prevent another catastrophic war in Europe. They thought that nationalism was the biggest threat to peace, so any form of nationalism had to be stamped out at all costs. They understood that popular sentiment would not support such a plan, so it had to be phased in quietly, gradually, and mostly for economic reasons, with the political changes occurring very slowly, over decades. But the new Europe was also an enormous opportunity for certain favored parties to make lots and lots of money. Corruption was inevitable, since the superstructure of Europe was non-democratic and thus unaccountable. The opportunity for corrupt behavior was made even more irresistible by the deliberate opacity of official doings in Brussels. Now, more than fifty years later, corruption is virtually all that is left. 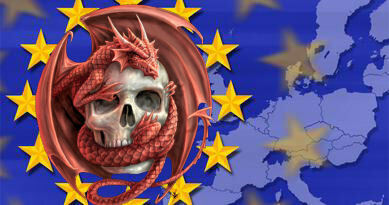 The European state is a rusted hulk covered with rapacious barnacles. Most activity at the EU level is intended to feather nests, enrich cronies, and entrench the oligarchs even further so that their positions can’t be threatened. And enormous, apocalyptic conflict lies ahead. The architects of the system wanted to prevent a cataclysmic war, but instead they guaranteed there would be one — just not the type they expected. This is what Fjordman has warned about, and what he, as the modern European Cassandra — shall we call him “Cassander”? — is powerless to prevent. 3. The Left in Europe is the problem, not Islam. If the Socialists had not imposed massive immigration on Europe, and had not pushed to destroy traditional institutions and customs (through Multiculturalism and political correctness), Islam would never have been a problem. The result of all their efforts, after the coming euro-inflation burns out the wealth of most of Europe, will almost certainly be catastrophic violence, the “clash of civilizations”. This is quite obvious — only the thin skein of temporary welfare-state prosperity is holding it back. The three points above are true, regardless of “Eurabia”. I’ve been educating myself about Europe for the past six years, steeping myself in recent history and political details. It’s all there, in the public record. All one has to do is connect a few dots to see what is happening. Study the historical record and current conditions, and you’ll see that it’s true: allowing Islam to remain in Europe is all but certain to bring on unimaginable violence and destruction. This is not what Fjordman wants, it’s not what I want, and it’s not what anyone I know wants. But regardless of what anyone wants, it is likely to happen. The window for avoiding it is rapidly closing. As you walked the lonely road of your certainty? That your warnings could not save. Oh Cassandra, so still and so grave. The political conditions which Breivik’s actions emerged were constructed by the progressives, Breivik is a product of multiculturalism. Analyse the language, for a European to criticize islam that attracts a prosecution of islamophobia, challenge enforced mass immigration and be branded and isolated as a far-Right racist these are the violent political conditions in which Breivik emerged. Note – Breivik’s actions “cannot be understood abstracted” yet constantly European people are force fed the line that both hard and soft jihad should be abstracted from islam and that there is no linkage, the jihadists as abstracted psychopaths, mindless multicultural crimminals without a cause. I see the real problem of left wing politicians in their inability to see the big picture. We do not need a multi-cultural country or a multi-cultural Europe, because we already have a multi-cultural world. We have shari’ah zones, they are known as Iran, Iraq, Somalia, Egypt, Jordan, Turkey etc. We do not need to give people, whose culture is diametrically opposed to ours, tolerance; this planet is large enough for them to find a country, culture, living style that agrees with them. We must not be greedy, there must be a place for every type of culture within a multi-cultural world and it is important that each autonomous culture has the right to insist on its boundaries. Those trying to kill the multi-cultural nature of the planet by mixing the cultures into different areas must be dissuaded from destroying our colourful heritages. Mixing all the colours just makes a muddy brown, keeping them spread across the globe creates a rainbow. Thank you very, very much for this posting. It clarifies a great deal. With all you do, I don’t like asking more, but if you could at some point show us or point us to the public record information you refer to, or what or where it is, that would help. I have no idea of where to find it or what I would be looking for in any precise sense. I will send a donation as soon as I can. At one time or another we have covered all the “public record” material here on this blog. It’s hard for me to find any given link, however, because there are so many of them. Fjordman has touched on most of the issues, so reading through the relevant topics in his archives should point you to his sources. Bat Ye’or, of course, refers to specific sources in her books and articles. The most recent example of what I was talking about emerged during the last year or so, when members of the Labour Party in Britain acknowledged exactly what they’d been doing when they deliberately imposed accelerated immigration and Multiculturalism in the UK. It was in all the British newspapers at the time, and was covered here at Gates of Vienna. I see you were rewarded by a quickening of sorts to bring the light to her eyes. Now, does she see? This was a rare opportunity to convert a blind person to a seeing one. Did it work? It’s too early to know. Only time will tell. 3. The Left in Europe is the MAIN problem, not Islam.